Finland has the most registered vehicles per person, with just over one vehicle for every resident, according to data from the World Health Organisation’s Global Status Report on Road Safety 2015. The report aims to provide a snapshot of the global road safety situation, with particular reference to the new target included within the Sustainable Development Goals aiming to halve the global deaths and injuries from road traffic accidents by 2020. Included in this is a country-by-country breakdown of population and registered vehicles, which the following chart is based on. In second place is Andorra, where, like Finland, there is more than one vehicle for every person. 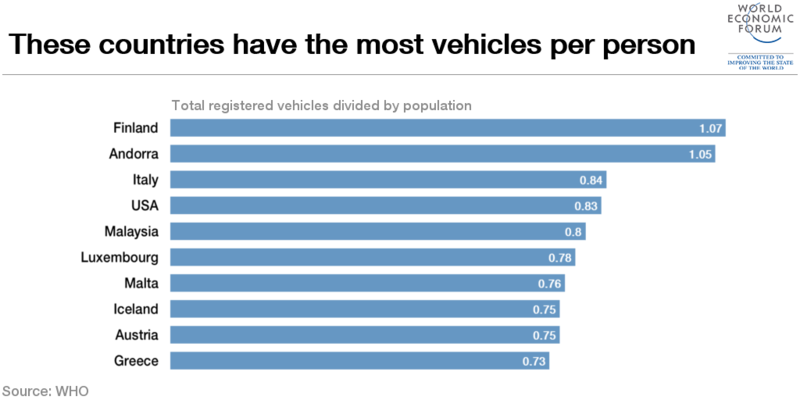 Italy completes the top three, with 0.84 vehicles per person. The list is dominated by European nations, with Luxembourg, Malta, Iceland, Austria and Greece also featuring. Non-European countries in the top 10 are the USA – where there are over 260m registered vehicles – and Malaysia. To keep up with the Agenda subscribe to our weekly newsletter. Author: Joe Myers is a Digital Content Producer at Formative Content. Is there a social solution to automation?